This page was visited times since July 5th,2000. Welcome to Dr. M. Sugandi-Ratulangi's Homepage ! 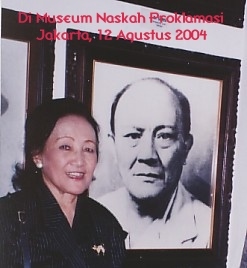 Below is my picture of 12 August 2004 photographed beside a photo of my father Dr. G.S.S.J. Ratu Langie. The picture was made at the "Museum Naskah Proklamasi Kemerdekaan"
Please visit also the websites on my recent projects: theRATU LANGIE CENTER and a vision of our "SENDOWAN" Amurang Project, both in North Sulawesi, INDONESIA.